What If HGH Could Cure Peyton Manning? Which individual is most responsible for his team's success, you ask? Easy. Peyton Manning. Who else could it be? No one knows what Detroit actually has in your boy Stafford (who is essentially a rookie in Bob Griese's body). Meanwhile, Manning's injury turned a playoff team into a gang even the Chiefs can point and laugh at. More interestingly, it revealed something surprising about the Colts. For a long time, Manning's presence gave them the luxury of drafting like the Buffalo Bills without anyone noticing—Football Outsiders counted only two Pro Bowlers in Indy's last five drafts, which is a particularly lousy record for a team built on a draft-and-develop model. 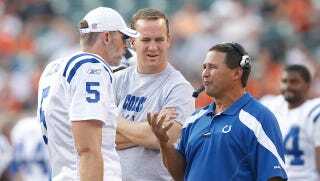 Through the prism of their present hopelessness, the Colts since 2008 look less like Bill Polian's whiz-bang organizational marvel of the preceding five years and more like a series of 10-and-6-ish teams on the bad end of the aging curve, with only Manning keeping them from the bottom half of the AFC. They'd become a Potemkin team. I'm just talking hypothetically. I don't have any reason to believe HGH or any other steroid would help Manning's recovery. But who knows, maybe they would? If so, would you be outraged if he used them to save his career, save his season? Of course, Whitlock is making a different argument here, and I think it's a good one: What happens if we find out that this stuff works? How does anyone make the moral case against extending the career of the best quarterback in NFL history? We've come to terms with the use of cortisone, without which the NFL would cease to exist altogether. How much longer can we keep the PED argument on that vanishingly thin line between enhancement and simple maintenance? (An NFL career is basically an ongoing campaign in not getting killed. Anything—a needle prick in the elbow, say—that lets you take the field when you might otherwise sit is, ipso facto, performance enhancement.) According to Fox Sports, Manning flew to Europe for a stem-cell procedure that evidently didn't work. All the tired old PED arguments are applicable here—it's not "natural"; it's an unfair advantage; it screws with the sanctity of the record books—but no one, that I've seen, has trotted them out. That's a good thing, but it also tells me that sports types care about those arguments only to the extent that they can be fit into the prevailing hysterias of the day.